You can add files in two different ways. The first method is more laborious but you may find it useful first time round to familiarise yourself with the various settings. Turn editing on and scroll to the section to which you want to add the file. 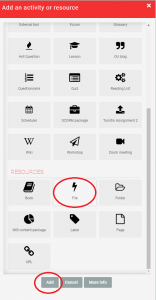 Click Add an activity or resource, scroll down to RESOURCES, select File and Add. Add a Name and optionally a Description. A meaningful name may mean a description is not necessary. If you add a description, select whether to Display… it. 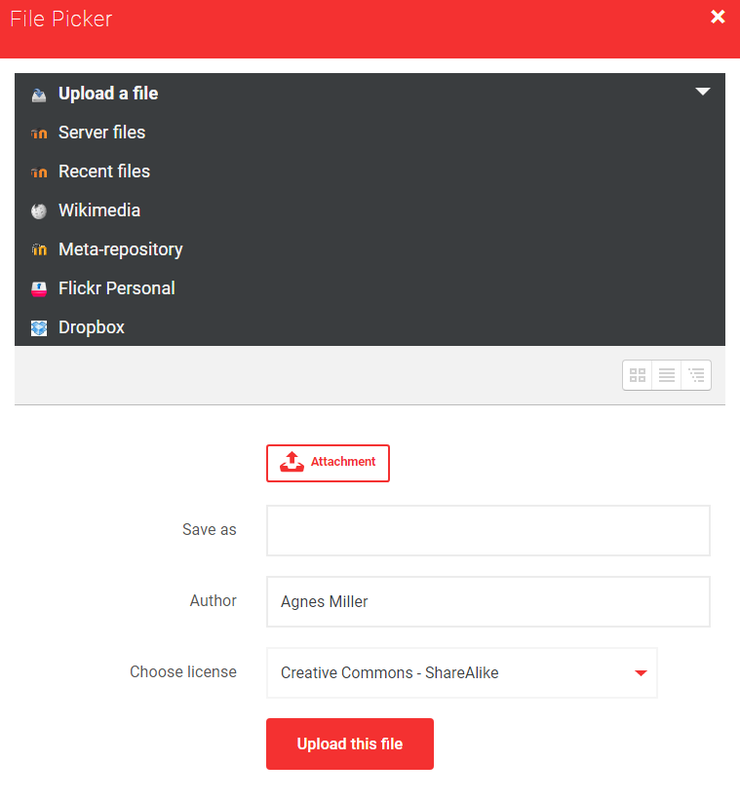 To select a file from your computer, choose Upload a file (on the top), and then Attachment to locate the file. This is a very similar process to attaching a file to an email. (You can upload pdfs, images and text files as well as all MS Office formats but be mindful of a student’s ability to open them and how they will appear when opened). Save as to save the file under a different name. Author can be changed if the default (your name) is not appropriate. N.B. Please ensure that you are not in breach of copyright law when adding files to Moodle e.g. files such as scanned chapters from books or journal articles downloaded from the internet must not be uploaded to Moodle. Click Upload this file to complete the upload. Before saving, you may want to choose a setting other than the default Automatic in Appearance. The default is fine in the majority of cases but if you have particular requirements for how files such as pdfs behave when clicked, check out the various options. For more information on each of the settings click that appears beside each setting, or at the bottom of the page for context sensitive help. Use Common module settings and Restrict Access if required. Finally, choose one of the Save options to complete the process. The file will appear at the end of the section. Use the move icon to reposition it as required. Reduce the size of the Moodle window so you can display your computer’s files alongside it. 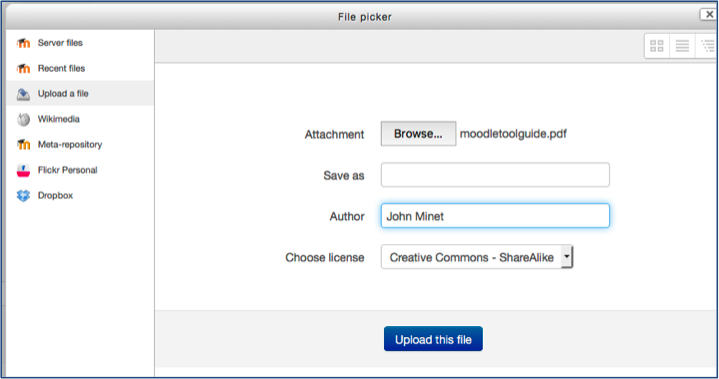 Select a file (or set of files) and drag them directly to the Moodle course homepage. They will appear at the end of the section you choose. This is much quicker than method 1. 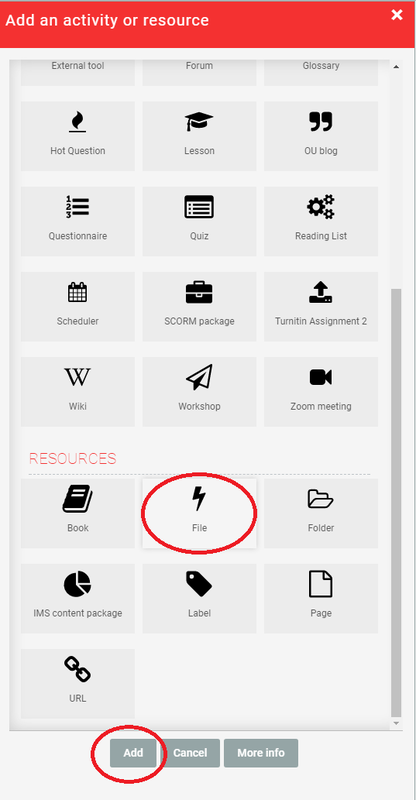 However, you may well need to make changes to names and/or settings as drag & drop onto the Moodle course’s homepage just uses the defaults and retains the original file name. Change settings including the actual file via Edit settings in Edit drop down menu. You can also Hide, Delete et al as appropriate via the Edit drop-down menu. To change the location of the file, use the Move icon to the left of the name.